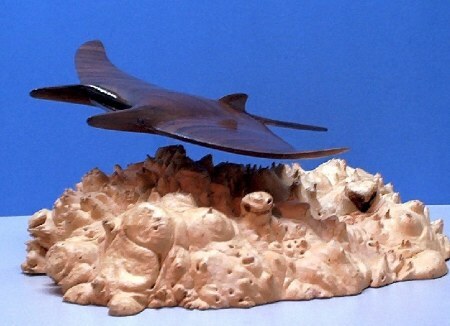 This manta ray was hand carved in Walnut wood. 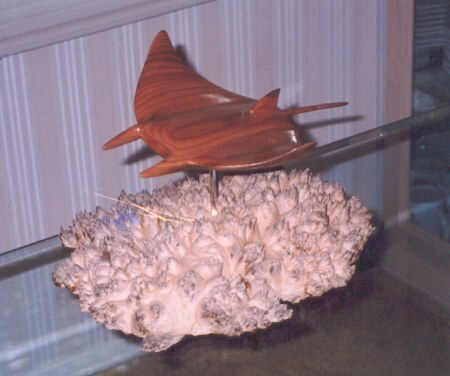 It is mounted on a Maple burl and is supported by an acrylic rod. The finished piece was used to create the mold for the Bronze and Pecan wood limited editions. It measures 12"L X 15"W X 8"H, and is currently on display in the Southwood Sculpture StudioIt is mounted on a Maple burl and is supported by an acrylic rod. The original was used to create a mold and a limited edition was cast in either bonded Pecan wood or cold cast Bronze. E Unfortunately, the bronze manta is no longer available.